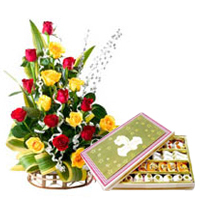 Impress your dear ones by sending this Tropical 20 Colorful Roses and Welcome Treat of 500 Gr. Sweets and elegantly brighten up their mood instantly. Why Order with Pune Online Florists. © www.Puneonlineflorists.com, All Rights Reserved.